Technology in the voice studio is a given today, even if ever-changing. If you are a voice teacher or student, you've undoubtedly observed that the age of the cassette player is coming to an end with the advent of digital recording devices, while the computer is being used to record lessons, analyze tone, and give lessons via the internet. 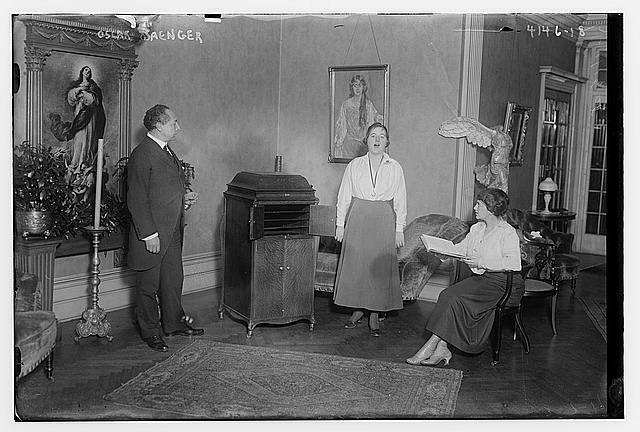 While the latter may seem like a novel idea, its genesis goes back to the invention of the gramophone and a gentleman named Oscar Saenger (1868- 1929), who was one of the first to capitalize on Edison's invention, producing a set of recordings for home instruction for five voice types - Soprano, Mezzo-Soprano, Tenor, Baritone, Bass. The records were published with an accompanying manual. The year was 1916. 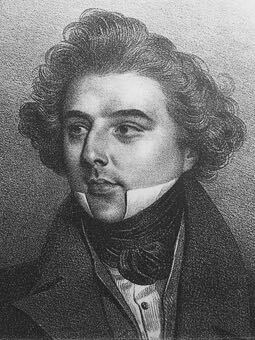 Saenger studied voice at the National Conservatory in New York with Jacques Bouhy (who was famous for originating the role of Escamillo in Bizet's Carmen), sang leading baritone parts in Germany and Austria for a year or two before returning to the Conservatory to join the faculty, and then set out on his own as a private teacher. 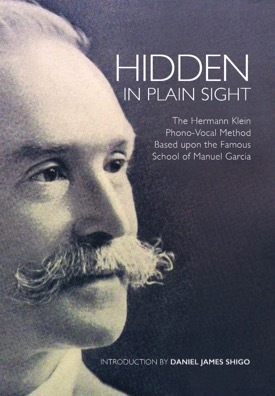 His students included Paul Althouse (who provided the voice for the tenor recordings), Leon Rains, Joseph Regneas (who taught Phyllis Curtin and was the first American to sing Hans Sachs), Bernice de Pasquale, Florence Hinkle, Orville Harrold, Marie Rappold, Rudolph Berger, Frieda Hempel, Mabel Garrison and Josephine Jacoby. By the 1920's, 35 of his students were singing at the Metropolitan Opera - no small accomplishment at a time when European teachers and voices were more highly regarded. 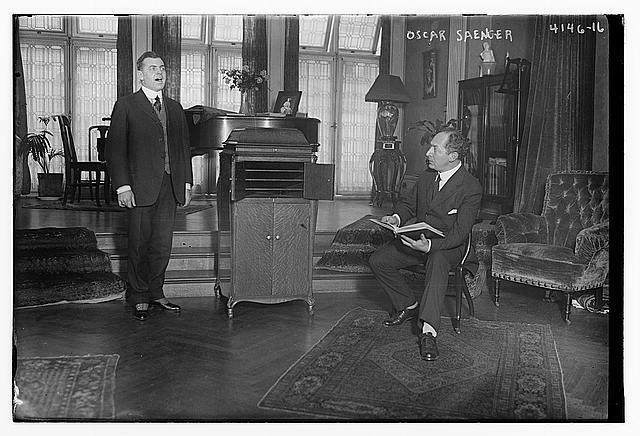 Saenger spoke about his teaching and the use of recording for vocal study with Harriette Moore Brower, the latter publishing their talk in her book: Vocal Master: talks with master teachers and singers, comprising interviews with Caruso, Farrar, Maurel, Lehmann and others (1920). You can read it here. It gives the reader a clear sense of how vocal study was conducted. Saenger also wrote an essay on what is necessary to have a career which appeared in The American history and encyclopedia of music (1910). You can find it here. It's surprising how much of his advice still applies a hundred years later. Saenger illustrates how arduous the task is, as well as how much preparation is necessary which, ideally, begins in childhood. As he sees it, those who aren't well on their way by their middle 20's are barking up the wrong tree. 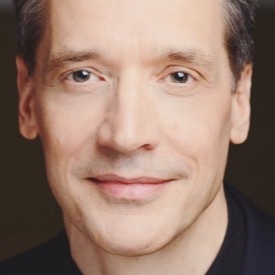 He does, however, cite one exception, that being the career of Dr. Ludwig Wüllner, a doctor of Philosophy who took to the stage as an actor and then began serious voice study in his early 30's. Curiously, he doesn't tell the reader that Wüllner's teacher was Anna. 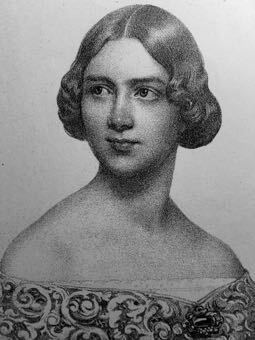 E. Schoen-René, who was Saenger's equal in regard to prestige and number of students at the Metropolitan Opera. But I digress. Preparation for a career also involves matters of vocal technique. And for that we turn our attention to Saenger's manual. A beautiful animated expression of the face creates the right conditions for a beautiful tone. Freedom of the lips is of great importance, as the expression of the face is lost if the upper lip cannot be raised. Raising the corners of the upper lip and lifting the cheek muscles help to give freedom and expression to the eyes. The soft palate is the back part of the roof of the mouth. Its freedom of action depends much on the freedom of the throat and tongue. It must rise, so that the roof of the mouth, back of the hard palate, may assume an arched shape, which is most favorable to the production of sound, sonorous tones, but care must be taken not to exaggerate this arch and to keep the soft palate free and flexible. The tone should be made to focus on the back of the upper front teeth and the hard palate (roof of the mouth). As an illustration: Close your lips and try to sing the letter M. A distinct vibration will be felt in the region of the hard palate and front teeth. That, as we have said, is the point on which most tones should be focused. In the case of the head tones the point of focus rises, until, in the extreme high register, the sensation is that of placing the tone high in the head. It is a matter of sensation and mental concentration. The way to place the tone forward is to think it forward. That is actually the way the student must focus his tone. He must think it into place and put it there through the exercise of a purely mental process. When we speak of 'placing the tone forward in the face' (masque), we mean to focus the tone forward in such a manner that the vibrations will resound in the cavities of the face. The vowel A (ah) when properly produced, demands the greatest freedom of the mouth, throat, tongue, tongue and jaw, and affords the most beautiful tone quality. This vowel, more readily than any other, reveals any rigidity and consequent closure of the throat, and so is the most valuable for vocalization. Saenger's manual is well worth looking at for a glimpse into past vocal practices and instruction. Quite popular at the time of its release, it is available in most libraries. Did Saenger's recordings and manual create singers? That's an open question. Raymond Sooy, who participated in the lengthy process of recording the singers involved had this to say in his unpublished Memoirs of my Recording and Traveling Experiences for the Victor Talking Machine Company. It took a long time to finish this series of records as each note must be perfect, and we recorded as many as twenty records of some lessons-these vocal scales were very difficult to sing perfectly. After these records had been made and listed in our catalog, I was advised that the first artist who learned to sing perfectly enough from these records to become an Opera singer, I was to be presented with a ticket for the opening performance but as yet I have not received the free ticket. 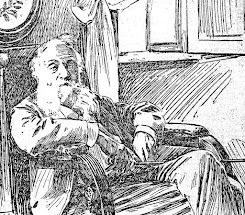 Saenger died quite young, at the age of 60. Paramahansa Yogananda spoke at his memorial service. There is one last curious thing to note. Remember Joseph Regneas, who I mentioned earlier as being the teacher of Phyllis Curtin? His real name was Bearnstein. 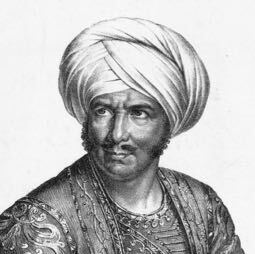 Regnas took his teacher's name after his death, spelling it backwards. Researching historical singers and methods brings me to your site almost daily. Thank you so much for all you have done! Thank you for your comment, Mister Rodger! It pleases me to know we share the same interests.